Why OMSB planted? To increase my carrying capacity and to allow for better drought management. So I could improve my business profitability without buying more land. as they do much better on grass country after coming of the saltbush. You cant fatten stock on omsb but you sure can grow them out well. Dry sheep do perform well on straight omsb and produce good wool. What financial benefits have been observed? I can run more stock while improving the ecological health of my country. 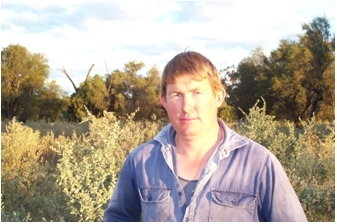 What I can say is that since saltbush and grazing our family has enjoyed the property more. We have a lot more chances to spend time as a family. Our stock always have feed so Im not forced to sell on a falling market when it becomes dry. I have never been able to do that unless I spent big money on supplementary feeding. Biggest OMSB impact? It has allowed me to enjoy farming again. Before omsb we were cropping, doing lots of hard work and going nowhere. Our country was going backward as well. This has all changed. The water cycle is improving along with our nutrient cycle and the omsb has been the catalyst to this. I reckon you could say it is a backbone to better land management and profit. Do you / if you had a salinity problem, do you think OMSB would help with controlling deep drainage and/or lowering the water table? It would have to. It just pumps water out of the ground because the roots are so strong. David has changed from a cropping/grazing operation to that of a straight grazing. OMSB has been the catalyst and the backbone for this change. He is now planning new developments with the grazing control he has from his omsb based grazing. Droughts now create many opportunities for financial gain, just because he has big saltbush fodder reserves.